So you’ve replaced paper or plastic at the grocery store with a cool green bag, but what about the plastic veggie bags? Looking at them float around the kitchen after a grocery run, I found myself thinking that my greens were not so green after all. 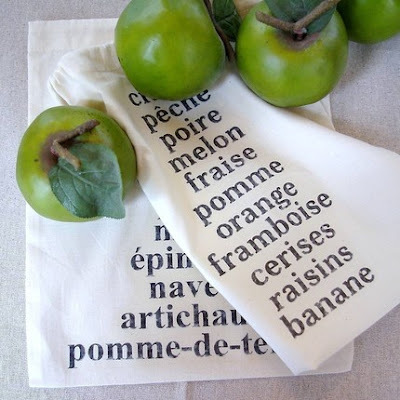 Cherries and mushrooms now have a chic alternative too- the reusable produce bag. I love this one from the Craft Pantry, but there are tons of other options out there. If you’d like a deeper shade of chartreuse, I bet you could make these little bags out of old tee-shirts. How cool would that be? I think about this every time I go to the store! And I always feel like a fool because I have my handy reusable shopping bag but yet pull a million plastic bags off the roll! These are great...and will keep the beets from staining up my other bag! I have been a plastic bag abstainer for years. I buy loads of loose fruit and veg and take it to the checkout. No one has complained to me once. Even brussel sprouts and mushrooms don't annoy them.